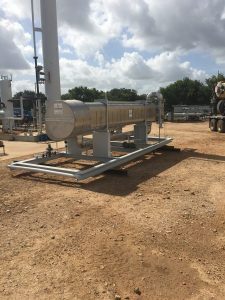 To produce an immediate processing upgrade to your natural gas stream, TransTex has a fleet of JT Skids of various sizes that are readily available and skid-mounted for quick installation. Our processing plants can increase your NGL recoveries by a pressure drop, condensing and removing ‘heavy’ hydrocarbons. Following gas separation and dehydration, high-pressure gas enters the JT unit through the heat exchanger for cooling. The natural gas stream then passes through a JT valve causing a pressure drop and undergoes a process called “adiabatic expansion.” This means that the gas is expanding in a system where energy can neither enter nor exit. With the energy stable, the temperature of the gas must drop to offset the pressure drop, this is called the Joule-Thompson (JT) effect. Next, the cooled gas is routed to the separator to remove the NGL. The outlet gas from the separator is routed through the gas/gas exchanger for inlet cooling and to warm up the sales gas. The NGL from the separator is routed to a separate, optional pressurized NGL storage tank or to a NGL pipeline. For more information about JT Skids, and to learn what type of equipment or plants will best suit your application, contact us today.